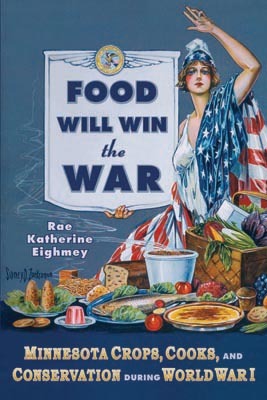 "Food Will Win the War!" 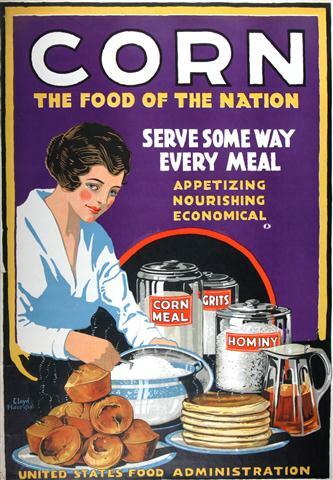 the U.S. Food Administration proclaimed. 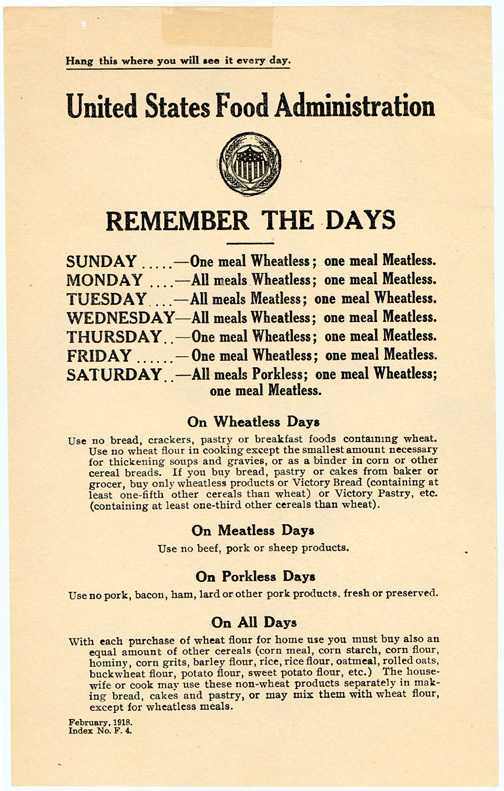 Instructing the folks at home to cut back on their wheat and meat intake meant more food to fuel the soldiers overseas. But how to make it through those Meatless Tuesdays and Wheatless Wednesdays before 1920? 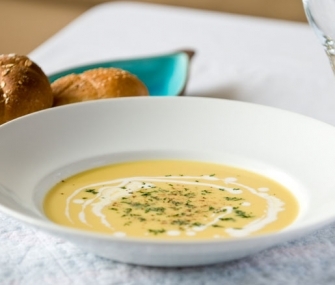 Take a stab at these recipes for the experience of WWI at home. 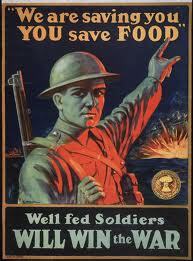 If you were an American soldier in World War I, food was an important part of how you fought. In the words of Napoleon himself, “C’est la soupe qui fait le soldat” (the soup makes the soldier). In the trench, you’d be receiving rations of canned meat (including roast beef, corned beef, salmon, and sardines), hard bread, salt, sugar, and coffee, as well as solidified alcohol and cigarettes. 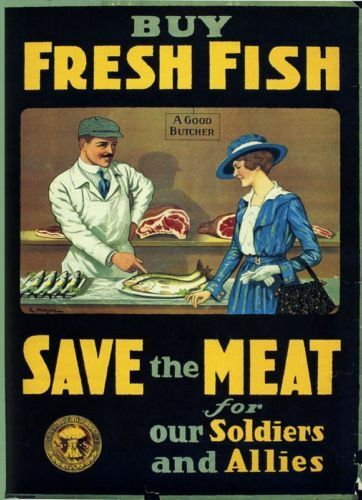 To help out the housewife and support the troops, below are some hearty and delicious recipes for surviving meatless and wheatless in America during the Great War. These common dishes in the early twentieth century are adapted from recommended summer menus in Good Housekeeping’s 1914 cookbook The Pure Food Cook Book. 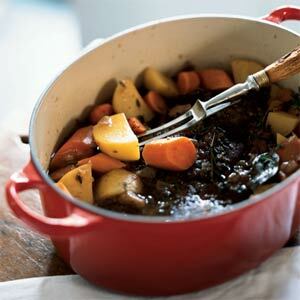 This rich and hearty meal was a typical dinner for families living in the early 20th century. Adapted from James Beard. Serves 6. Heat the corn kernels in the chicken broth in a medium saucepan. Season with salt, pepper, and a little grated onion or finely chopped green pepper. In a separate bowl, stir egg yolks into cream. When the corn mixture boils, pour it over the cream and egg mixture in a thin stream, stirring constantly so that the egg does not scramble. Blend well together and season to taste. Adapted from Cooking Light. Serves 10. Preheat oven to 350º. Heat olive oil in a large Dutch oven over medium-high heat. Sprinkle chuck roast with salt and pepper. Add roast to pan; cook 5 minutes, turning to brown on all sides. Remove roast from pan. Add onion to pan; sauté 8 minutes or until tender. Return browned roast to pan. Add the red wine, thyme sprigs, chopped garlic, beef broth, and bay leaf to pan; bring to a simmer. Cover pan and bake at 350° for 2 1/2 hours or until the roast is tender. Remove thyme sprigs and bay leaf from pan; discard. Shred meat with 2 forks. Serve roast with cooking liquid. Garnish with thyme leaves, if desired. Adapted from Martha Stewart. Serves 6. Peel and cut potatoes into 1 1/2-inch-thick slices. Place in a medium saucepan. Cover with cold water; add 1 tablespoon salt. bring to a simmer. Simmer until potatoes are tender, about 20 minutes. Meanwhile, heat cream and butter in a saucepan over medium heat. Drain potatoes and press through a potato ricer into a large bowl (for convenience, you can also beat the potatoes with an electric mixer until the lumps disappear). 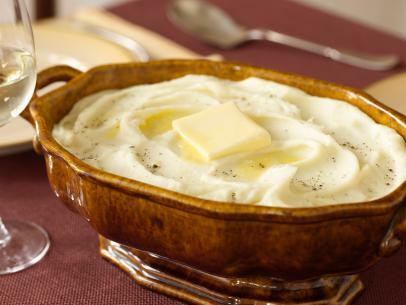 Stir potatoes until smooth, then add hot butter and cream, stirring constantly. Add salt and pepper to taste. You can also include nutmeg, fresh chives, minced garlic, or another favorite seasoning. Melt 1 cup unsalted butter in small saucepan. Bring the melted butter to a boil and set aside to cool. Once the milk solids have risen to the top and the whey has settled to the bottom, skim off the top layer and pour clarified butter into a serving dish, being careful not to include the watery liquid in the bottom of the pan. Serve the drawn butter with fresh steamed or grilled asparagus. Adapted from Bon Appetit. Serves 8. Bring 3/4 cup plus 2 Tbsp. sugar and 2 Tbsp. water to a boil in a small saucepan over medium-high heat, stirring to dissolve sugar. Boil, swirling pan occasionally and brushing down sides of pan with a wet pastry brush, until mixture turns a deep amber color, about 4 minutes; remove caramel from heat. 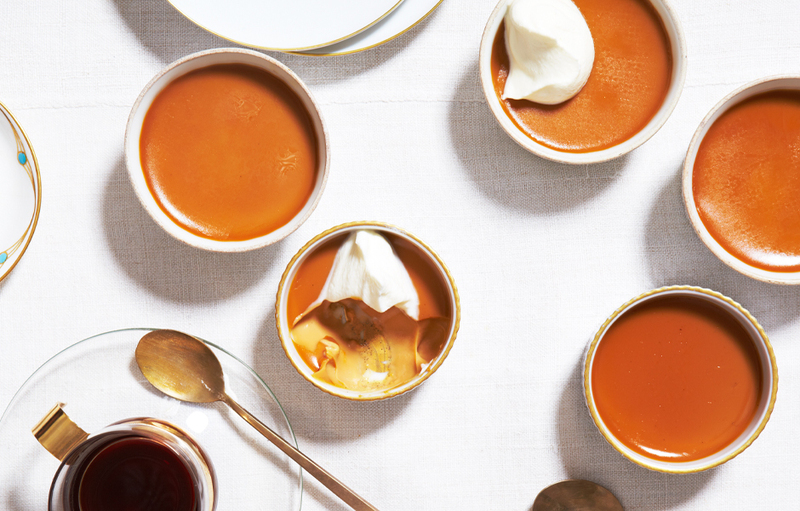 Divide custard among ramekins and place in a kitchen towel–lined large baking dish or roasting pan. Fill pan with water to come halfway up sides of ramekins. 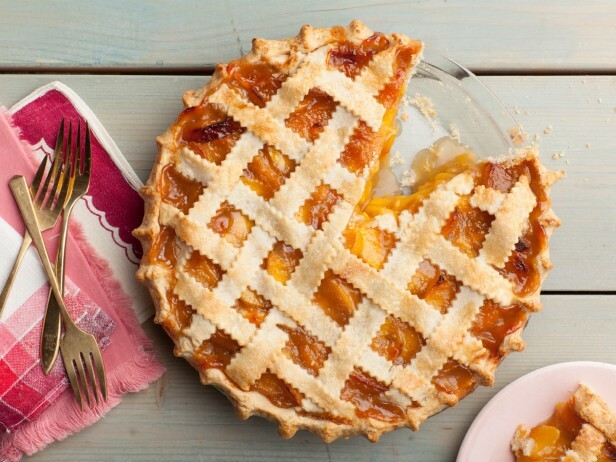 Bake until custard is just set but still jiggly in the center, 60–70 minutes. Remove ramekins from baking dish; place on a wire rack and let cool. Chill puddings, uncovered, at least 3 hours. Puddings can be made 2 days ahead; cover and keep chilled. For serving: Beat 1 cup heavy whipping cream and 1 tablespoon sugar until soft peaks form (can be done with an electric mixer or a whisk). Top puddings with whipped cream and sprinkle with flaky sea salt. For a meatless meal, we’ve gone for a light supper menu that makes the most of fresh fish and summer produce. Recipe adapted from Coastal Living. Serves 6. Combine brown sugar through black pepper in small bowl. Remove pin bones from salmon, if necessary, and coat fish evenly with rub. Cover with plastic wrap or foil, and chill until ready to grill. 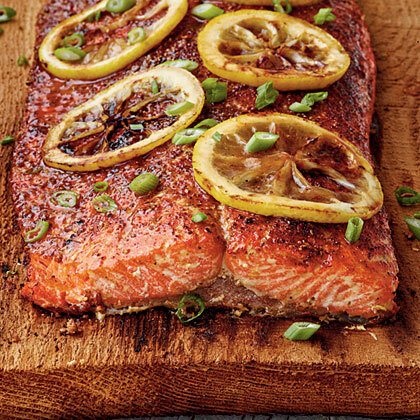 Place planked salmon on grill, cover, and grill 20 minutes or until desired degree of doneness. (Check occasionally to make sure edges of plank don’t ignite.) Garnish, if desired, with green onions. Adapted from the Food Network. Serves 8. In a large bowl, whisk together the buttermilk and eggs until smooth. Add the squash and zucchini, tossing gently to coat; let stand for 30 minutes. Drain the squash, discarding the buttermilk mixture. 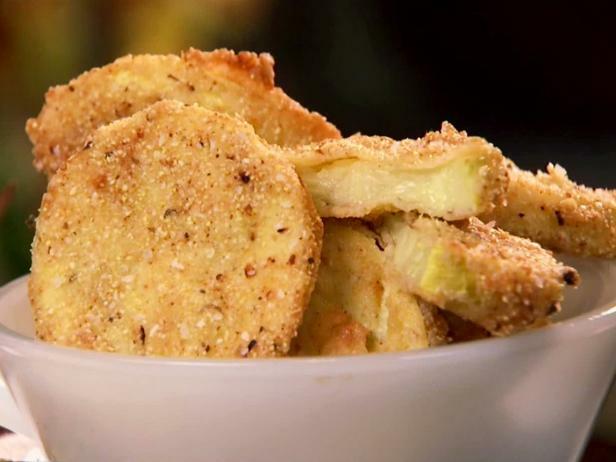 In a shallow dish, combine the cornmeal, flour, baking powder, salt, and pepper, to taste. Dredge the squash and zucchini in the mixture to coat. Fry the squash, in batches, until golden brown, 2 to 3 minutes. Drain on paper towels. Serve immediately. Remove the husks and silk from 8 fresh ears of corn. Bring a large pot of water to boil and add the corn, simmering five to ten minutes until corn is tender. Recipe adapted from Southern Living. Serves 8. Cut 1 1/3 cups butter into small cubes, and chill 15 minutes. Stir together 4 cups flour and 1 1/2 tsp. salt. Cut butter into flour mixture with a pastry blender until mixture resembles small peas. Gradually stir in 1/2 cup ice water with a fork, stirring until dry ingredients are moistened and dough begins to form a ball and leaves sides of bowl, adding more ice water, 1 Tbsp. at a time, if necessary. Turn dough out onto a piece of plastic wrap; press and shape dough into 2 flat disks. Wrap each disk in plastic wrap, and chill 30 minutes to 24 hours. Bake at 425° on lower oven rack 15 minutes. Reduce oven temperature to 375°; bake 40 minutes. Cover loosely with aluminum foil to prevent excessive browning, and bake 25 more minutes or until juices are thick and bubbly (juices will bubble through top). Transfer to a wire rack; cool 2 hours before serving. For more details about World War I, visit www.cambridge.org/firstworldwar or cambridgewwi.tumblr.com.